Aqua Security for PCF enables users deploying apps to PCF to automatically scan application or container artifacts for vulnerabilities and prevent them from being deployed. Aqua Security for PCF empowers enterprise users to apply security best practices early in the build process to ensure that only code in compliance with their organization’s security and compliance policies is deployed. Application or container artifacts are scanned for vulnerabilities, secrets, and malware. Scans can be done directly from CI/CD tools (e.g. Jenkins, Visual Studio Team Services, Bamboo). Identify and block non-compliant application or container artifacts based on pre-configured assurance policies that check for: authorization, CVEs and score, presence of hard-coded secrets, presence of malware. Add custom compliance checks to identify security and compliance risks (e.g. PCI, GDPR data). Actionable mitigation information is provided on detected vulnerabilities for fast remediation. 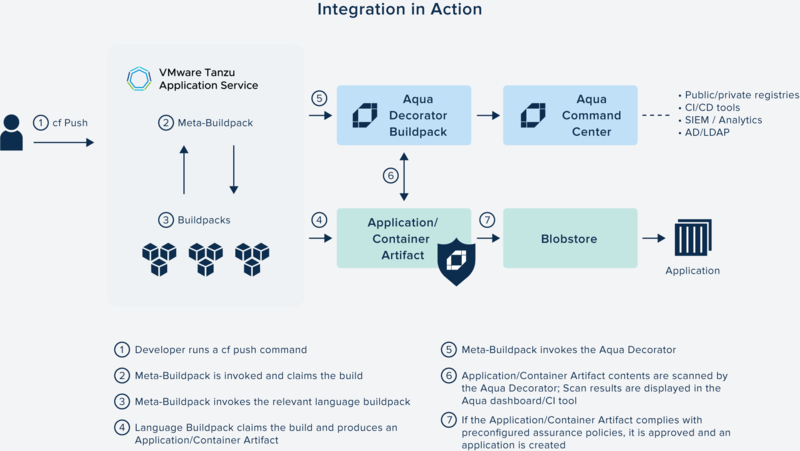 Available as a language agnostic meta-buildpack for deploying native integration applications in any language.